The MacGregor Lite Machine Ball w/ Seams is the ideal training ball for all ages. 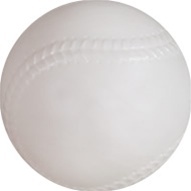 It was designed to be safe for indoor or outdoor use but because of its unique construction, these balls will travel as far as a regulation ball. Can be used with most baseball pitching machines. Compare to Atec SFT® balls. It is perfect for me due to it being light weight.